Although summer is officially over, it’s still my favorite time of year. It’s also a time that always makes me think of sharks. Perhaps it’s because the warm weather of the summer months makes more people enter the ocean to play than at any other time of year, which can put them closer to live sharks than they ever are in their daily lives. I’ll be perfectly straight – I love sharks. They alternately fascinate and terrify me, especially since I’m a SCUBA diver and there’s always a possibility of a shark encounter every time you enter the ocean. I know I’m not alone in my fascination with sharks because they remain a popular topic on television and film. The urban legend of sharks being cold-blooded savages is just that – legend – because research on sharks in the last 20 years has proven they are not the mindless killers we’ve believed them to be. In fact, what we’ve learned about sharks is that they play a critical role in the ocean ecosystem as apex predators and that overfishing of them has cascading effects on many other species. 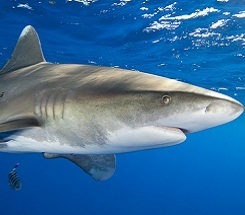 Biologists estimate there are more than 1,200 species of shark in the world’s oceans. With the known species numbering just over 500 it’s clear there’s a tremendous amount of information we don’t know about sharks and shark species, which makes it a fascinating field of research with countless new discoveries to be made. Quite a few shark species have some really interesting characteristics and very little is known about them. I’ve dug up some fascinating factoids about some lesser-known species of sharks you may or may not have seen in the press before. Lantern shark – these sharks are very tiny (about the size of your hand) and live in the deep sea. Like other deep-sea fish (such as the viper eel and deep sea angler), lantern sharks give off their own light using light-producing organs called photophores, which makes them glow in the dark. The light organs form a pattern on their bellies and flanks. Scientists believe it give the sharks a form of counter-illumination. When viewed from below the lights on their bellies break up the outline of the sharks, making it difficult for potential predators to see the outline of the shark. Cookie cutter shark – this is also a species of deep sea shark that is a nocturnal feeder. Cookie cutter sharks are small fish that are known for making a vertical migration to surface waters at night where they take very characteristic bites that are perfectly-rounded plugs of flesh from their victims. Most of the victims of these little sharks are large fish, whales, sea lions, and sometimes submarines and undersea cables. Greenland shark – one of the largest species of predatory sharks that rivals the size of the Great White, the Greenland shark is a slow-moving species that inhabits the icy cold waters of the North Atlantic around Greenland and Iceland. These sharks are predatory, having fed on seals and fish, as well as opportunistic, owing to the fact that reindeer remains have been found in the stomachs of these sharks. The flesh of the Greenland shark is toxic to eat because of the presence of trimethylamine oxide in their body tissues. The byproduct of this substance causes a form of intoxication that affects nervous tissue. They also have very high levels of urea in their body tissues that give the flesh of dead Greenland sharks a very characteristic odor of urine. Prehistoric frilled shark – a most bizarre-looking species of shark that has rarely been seen alive and is believed to be a deep ocean dweller. This shark has a primitive set of gills and gill slits on an elongated head with a long snout filled with backward-facing, needle sharp teeth. Along with a long, narrow and highly flexible body it has the overall appearance of a snake, which scientists believe may have given rise to ancient tales of giant sea serpents. Megamouth shark – First discovered in 1976, very few specimens of this rarely-seen shark have been found. With an overlarge head and a body length rivaling the Great White shark (up to 18 feet long), this deep sea shark is primarily a filter feeder, like the basking and whale sharks. Megamouths also have photophores around their mouths, which scientists believe may act as lures for plankton and small fish. The most important discovery made in the last 20 years of shark research is that sharks are endangered around the world. A study published in 2008 of shark numbers in the North Atlantic showed large coastal shark species, such as tiger, bull, and hammerhead, have plummeted over 95%. Shark researchers are also working to determine what is causing shark numbers to drop so precipitously.